Very nice light fixture. Has six bulbs and great lighting over game table/pool tables etc. $35.00. Contact Charlotte if interested. 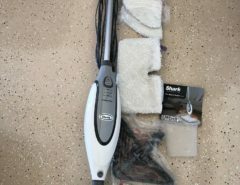 Shark Steam Mop…only used a handful of times. Breakfast nook dining table and four chairs. Cushions included. Flower arrangement is for sale for $25 Table and cover is $35. Size: 30″ tall and 30″ in diameter. Dark wood china cabinet including two large drawers and internal lighting feature. Very good condition. Set of three matching wood tables- coffee and two end tables. Minor surface scratches. Like new. Nice showpiece. Heat or no heat. Troy-Bilt 4 cycle gas edger. Like new. Less than a year old and rarely used. Set of Four. Sold as Set. Very good condition.